I had an amazing weekend in Indianapolis with the #ExperienceBuick crew, checking out the NCAA Semi-final and Championship games was unbelievable. But you know me. I am all about the food. We had really great meals throughout the weekend, but I wanted to highlight one meal in particular because it was exceptional. I am not a huge fan of hotel restaurants. There are exceptions (hello Georges V…). So often they are over-priced, with rude staff (always dealing with non-locals) and the menu descriptions don’t live up to their witty wording. Spoke & Steele inside Le Meridien hotel (you know how I love my Starwood Hotels!) is one of the good guys. Absolutely stunning on the inside. Exceptionally friendly staff, clever cocktails and food that will make you want to return to Indianapolis just for a meal. They are a new restaurant, and if they are experiencing jitters, hiccups or rookie mistakes, I did not catch anything awry. Service was impeccable, something that can get harry with a large group (something we experienced at other spots during our weekend) and the staff kept up with our every need. 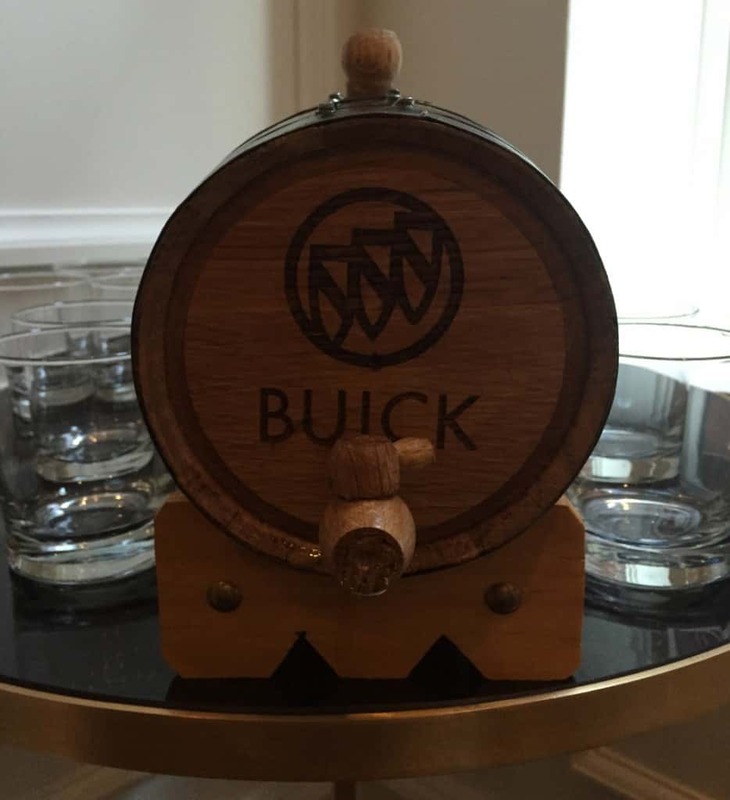 We were welcomed with a custom made cocktail – instead of bottle service, we had barrel service in a Buick-branded barrel. “Down the barrel’ was an extremely smooth mixture of white whiskey, sweet vermouth, grand marnier, Fernet Branca. Generally speaking, I can only have 2-3 alcoholic drinks (inheriting a bit of my parent’s alcohol intolerance has kept me out of a lot of trouble in my life!) but for some reason I was able to drink nearly 4 of these without any negative impact. 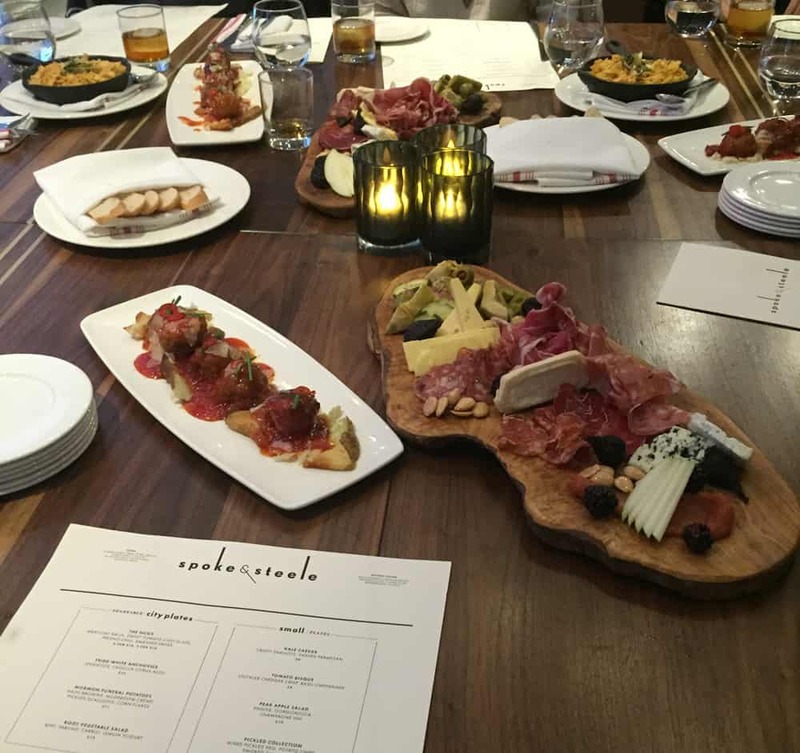 As we toasted the evening a round of appetizers hit the beautiful wood table – a charcuterie plate made up of delicious meats and sausages, fruits, nuts and berries, and regional cheeses. I could have eaten this as a meal on my own and I suspect a couple would be highly satisfied with a bottle of wine and a charcuterie plate at the bar. We also had meatloaf nubs. Still not quite sure what a nub is other than tasty. Lastly was one of the stars of the evening, the Mormon Funeral Potatoes, a family recipe that the restaurant’s chef Tyson Peterson brought with him. Based on comments on my Instagram feed, some people have dropped “funeral” in favor of Mormon Party Potatoes due to the sad connotation that comes with the word funeral. Whatever its name, I have never tasted anything like it and it was awesome! You’ve got hash-browned potatoes, mushroom creme, baked in a skillet with pickled scallions – and then, then you add corn flakes? Brilliant! Creamy, salty, crunchy, I’ll take it! The menu at Spoke and Steel consists of small plates, of which we sampled the three, large plates, and simple protein plates. Simple proteins allows you to select meat choice and add any number of sides. 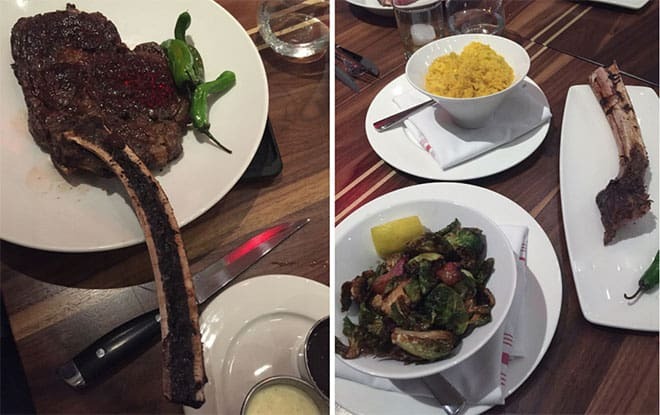 I split the 24-ounce Tomahawk steak with a fellow diner and then we shared Brussel sprouts and corn pudding. I had not had corn pudding in years and then just in the last two weeks I have had it twice! This version was exceptional, just the right amount of sweetness and a few whole kernels here and there. There were 12 of us so we had the opportunity to sample many of the mains: a Wagyu beef hamburger, ahi tuna, a pork chop and short ribs. Everyone unanimously agreed that it was the best meal of the weekend. I definitely have to agree! We should have not had room for dessert but that didn’t stop us! 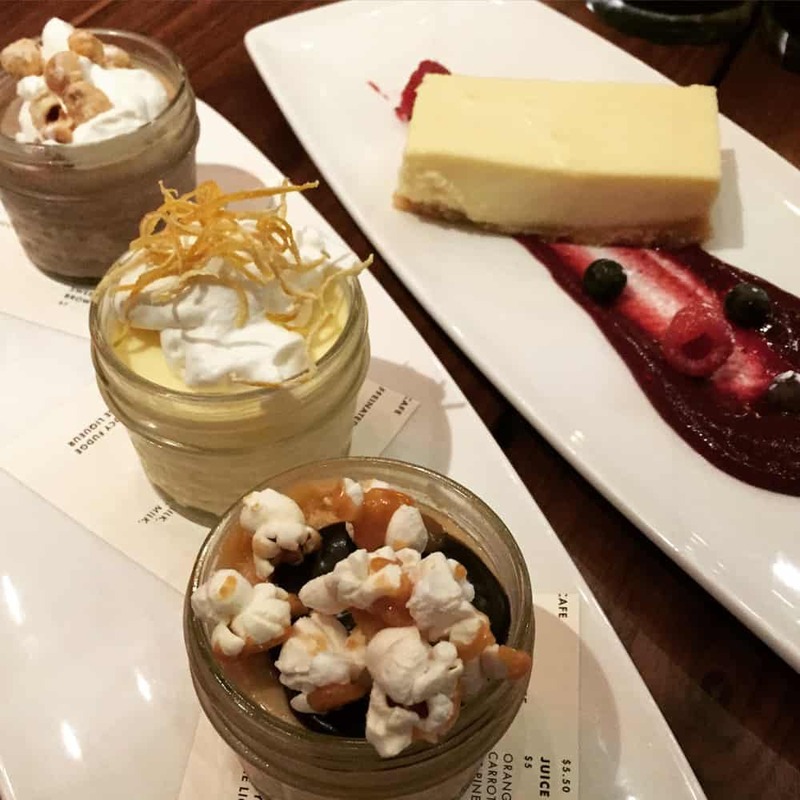 We ordered a trio of pots – chocolate, lemon and salted caramel, plus a cheesecake to share. While we ate all the pots, we all agreed the cheesecake was the star of the dessert round. The chocolate pot de creme was not chocolatey enough, that needs to be worked on. It was a very memorable meal, at a very memorable place, with very memorable people. I see big success for this new restaurant! 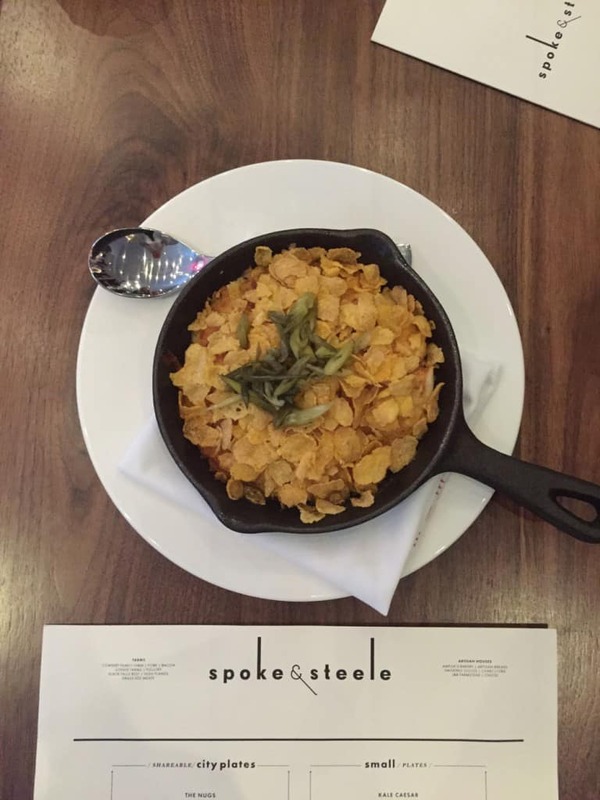 If you are heading to Indy, check out Spoke and Steele inside the Le Meridien Hotel located at 123 S Illinois Street in Indianapolis. Ask for Tory, she will treat you right! Follow them on Instagram (beware they will make you hungry) on Twitter or Facebook. This meal was part of my NCAA weekend with the #ExperienceBuick project. Despite the fact that my meal was paid for, all opinions are my own. You know how serious I am about my food! How about you? Got a favorite Indianapolis restaurant? 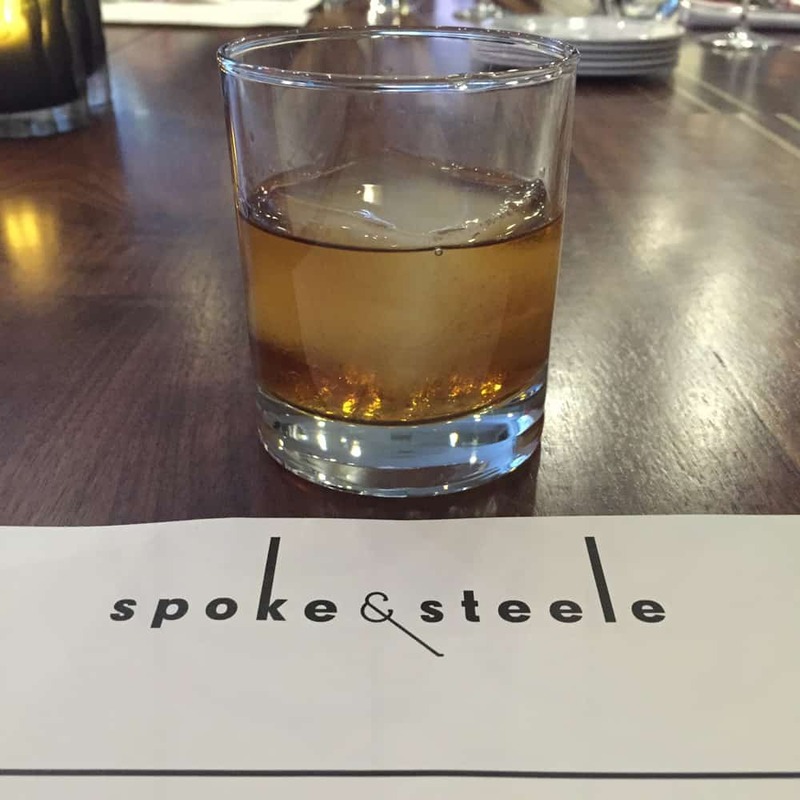 Think you might check out Spoke & Steele on your next visit? 1. That cocktail sounds phenemonal. 2. So do the party potatoes. 3. I think “nubs” is my new favorite food word. That big steak comes with a big handle! The pot trio looks great, too. You look so cute in your Chucks on the basketball court in the other post. Congrats, Andi. You make a great emissary for Buick. This place looks like quite a find! I usually have the same reaction as you when it comes to restaurants in hotels but this looks beautiful and creative. Those potatoes sound intriguing and the “pots” for dessert look amazing. Another reason to go to Indy! Forget the drinks and everything else, give me three of those charcuterie platters!!! Oh my!! That looks absolutely incredible! What a find, and I am surprised to hear that this restaurant is in a hotel! Very impressive! You had me at the picture of the cocktail and it just kept getting better from there. WIll definitely keep this in mind the next time I’m in Indianapolis. Looks so good! I could use a drink right about now on this Friday afternoon and that looks like a tall glass of weekend to me! I haven’t heard of Funeral or Mormon Fries either! I’ll have to keep an eye out for them if I go to Indianapolis. What a blast you had. I hope you were for Duke. The food looks amazing! If you get back there, have a drink for me! I would like to know what a “nub” is too! That’s an awesome word to use for a small creation in the kitchen! Those desserts looked divine by the way! Looks like you had a fantastic time with amazing and tasty food! I am not a fan of hotel food either. Often times, I have found that the food wasn’t really that good. However, everything here looks so tasty. You can tell it was a great restaurant. Glad you told us about this one. I will check it out. Thanks! i’m all about the starwood hotels too. haha jacob thinks i’m a princess.. but i just love them! the food looks amazing! I am with you on most hotel restaurants not living up to stand but sounds like you found a winner. The food looks absolutely delicious, I’m so hungry right now just looking at it. The food looks great! I agree with you about some hotel resturants. This resturant looks very nice. Wow, it looks liker Buick really took care of you…the food looks awesome, especially the cheesecake :). Thanks for sharing your experience with us! I was going to comment what my favorite one would be, but they all look amazing. I don’t know if I can decide on just one. Wow, everything does look amazing. This is the kind of place you want to visit again and again. I’m excited to go just from looking at the photos! OMG that food looks AMAZING!!! What a great restaurant! I really love the decor and spectrum of it. I think the food looks awesome and I would definitely go and eat it. Looking at those food makes me hungry. Sounds like a great event for you all. That food looks amazing! The place looks fabulous too, like a really great place to eat that’s for sure! As always, it looks delicious! Goodness! This food sounded divine enough for some of us to take the trip for it. I think I would dive right into the cheesecake! Oh wow, this looks like a wonderful place to visit. I have never been to Indianapolis. The establishment is so cozy. The food amazing. This sounds and looks like an awesome place to dine indeed. I have never heard of barrel service before. The food looks amazing. Thanks for sharing. Oh man, if I am ever in Indy I am DEFINITELY visiting this place! We live about 20 minutes away from the Spoke and Steele and hit it whenever the Colts play on Sunday afternoon! @Bill, it is delicious, lucky you to have it so close! What gorgeous food. It certainly doesn’t look like hotel food at all. I was always surprised when Anthony Bourdain actually liked some of the hotel foods. @Shannon, I was surprised as well, I tend to avoid hotel restaurants, but this one was FANTASTIC! @Linda, if you aren’t from the Midwest, it could be surprising, a good surprise!